I run Windows as my daily driver but I use WSL (Windows Subsystem for Linux) all day long but WSL is just the command-line and has some perf issues with heavy file system work. I use Docker for Windows which works amazingly and has it good perf but sometimes I want to test on a full Ubuntu Desktop. ASIDE: No joke. My Linux/Ubuntu bona fides go back a while. Here's me installing Ubuntu 10.4 on Windows 7 over 8 years ago. Umuntu ngumuntu ngabantu! 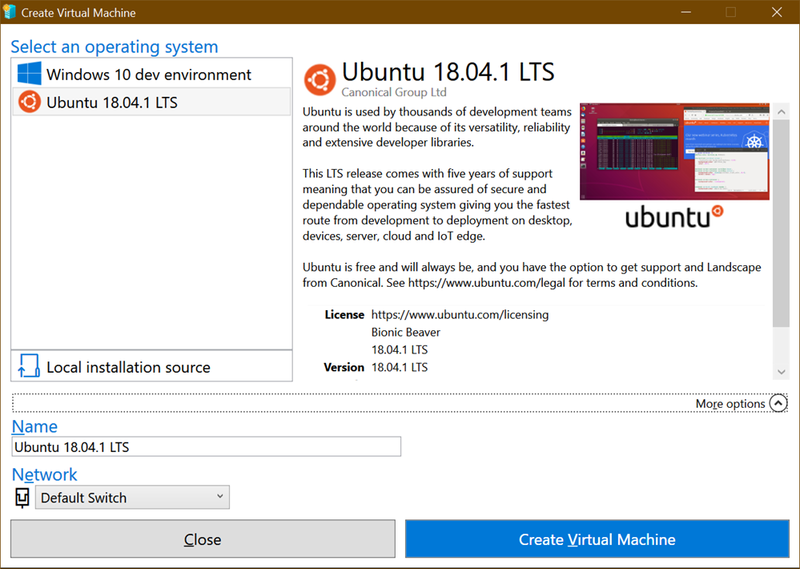 To be frank, historically Ubuntu has sucked on Window's Hyper-V. If you wanted to get a higher (read: usable) resolution it would take a miracle. If you wanted shared clipboards or shared disk drives, well, again, miracle or a ton of manual set up. It's possible but it's not fun. Why can't it be easy? Well, it is. I installed the Windows 10 "Fall Creators Update" - yes the name is stupid. It's Windows 10 "1809" - that's 2018 and the 9th month. Just type "Winver" from the Start menu. You may have "1803" from March. Go update. Windows 10 includes Hyper-V Quick Create which has this suspiciously short list under "Select an operating system." Anytime a list has 1 or 2 items and some whitespace that means it will someday have n+1 list items. Recently Ubuntu 18.04.1 LTS showed up in this list. You can quickly and easily create an Ubuntu VM from here and it's all handled, downloading, network switch, VM create, etc. I dig it. So click create, start it up...get to the set up screen. Now, here, make sure you click "Require my password to login." What we want to do won't work with "Log in Automatically" and you don't want that anyway. 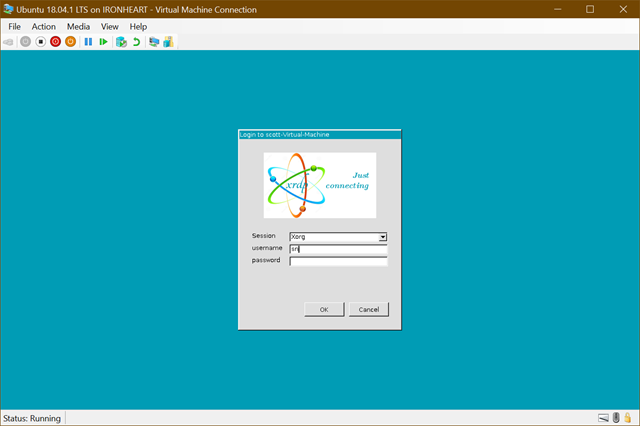 After you've created your VM and got it mostly setup, close the Hyper-V client window. Just X it out. 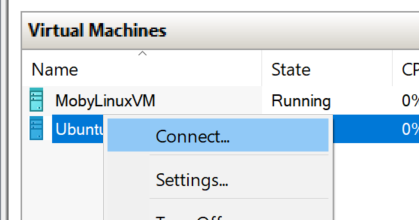 The VM is still running of course. Go over to Hyper-V Manager and right click on it and "Connect." You'll see a resolution dialog...pick one! Go crazy! Do be aware that there are issues on 4k display but you can adjust within Ubuntu itself. Now, BEFORE you click Connect, click "Show Options" and then "Local Resources." Under here, uncheck Smart Cards and Check "Drives." Click OK and Connect...and you get this weird dialog! 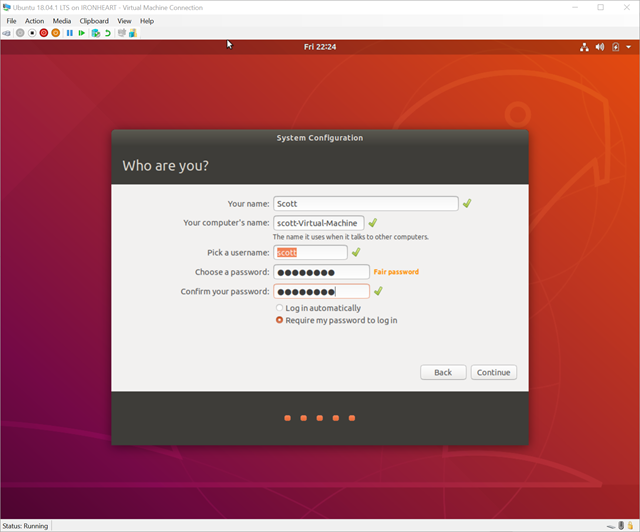 You're actually RDP'ing into Ubuntu! Rather than using the historical weird Hyper-V Client stuff to talk to Ubuntu and struggle with video cards and resolutions, here you are literally just Remote Desktoping into Ubuntu using integrated open source xrdp! Here's an even better possible future. What we REALLY want (don't we, Dear Reader) is Dynamic Resolution and Resizing without Reconnection! 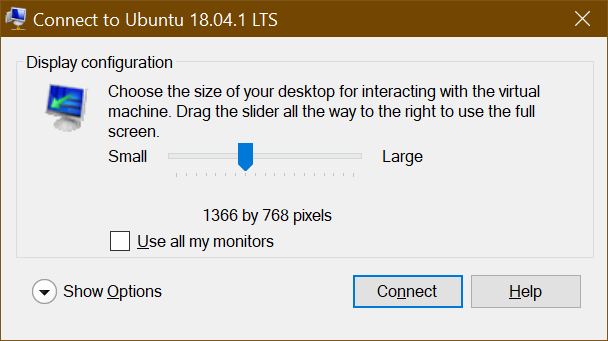 Today you can just close and reconnect to change resolutions but I'd love to just resize the Ubuntu window like I do Windows 7/8/10 VM client windows. The feature "Dynamic resolution update" was introduced in RDP 8.1. It enables to resize screen resolution on-the-fly. Since we are using xrdp and that's open source over https://github.com/neutrinolabs/xrdp/ AND there's even a issue about this AND a lovely person has the code in their own branch and agreed to possibly upstream it maybe we can start using it and this great feature will just light up for folks who use Hyper-V Quick Create. Certainly we're talking weeks and months here (unless you want to help) but the lion's share of the work is done. 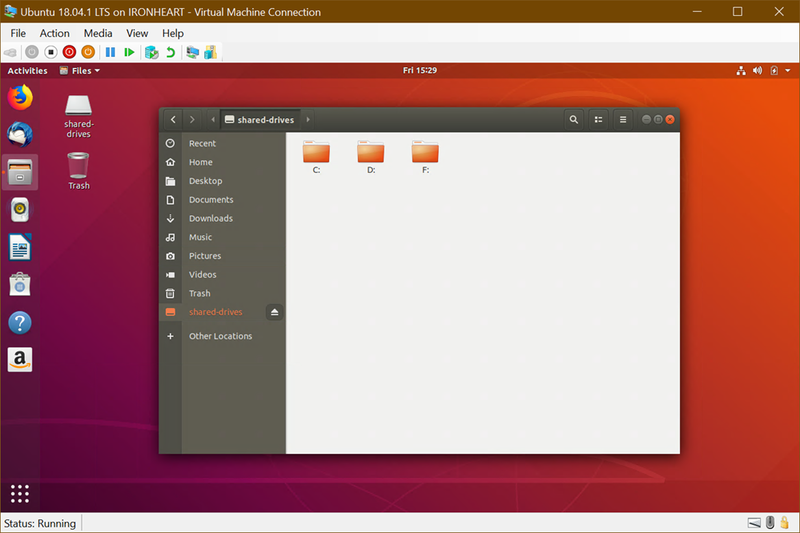 I'm looking forward to resizing Ubuntu VMs dynamically. What's in Enhanced Mode Today? Back to today! 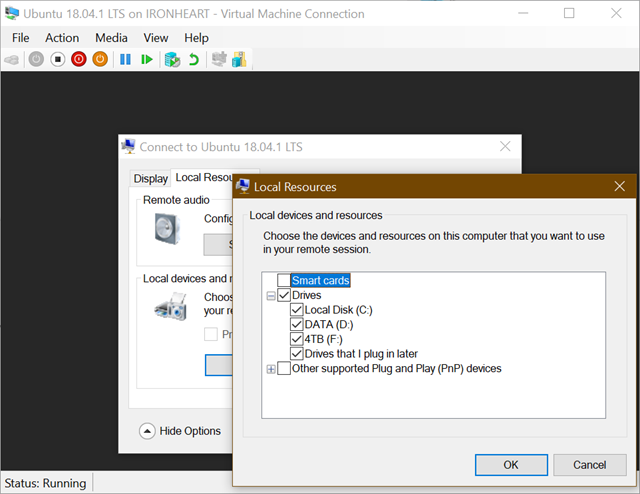 You can read about how Linux VMs (Ubuntu or Arch) are set up in this GitHub repo https://github.com/Microsoft/linux-vm-tools You can set them up yourself with scripts, but the nice thing about Hyper-V Quick Create is that the work is done for us to make these "enhanced session" RDP-friendly VMs. No need to fear, you can just read the scripts yourself. 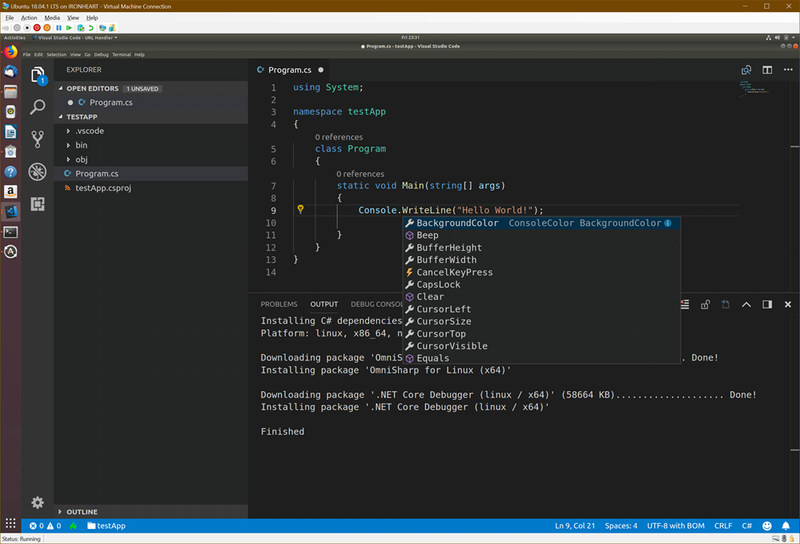 What about installing Visual Studio Code? Of course. And also .NET Core.NET Core, natch. This took like 10 min and 8 of it was waiting for Hyper-V Create to download Ubuntu. Try it out! You're saying that Docker for Windows is great, however I found two issues which made me leave Windows in terms of development. The 1809 worked just fine for equally as many if not more people than it gave problems to, judging by forum posts - me being the case of where it worked (custom build desktop and work Dell desktop). Haven't MS now fixed and reissued it now, it's old news after all?